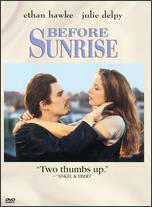 Director Richard Linklater creates a cinematic valentine to love in the movies with "Before Sunrise". The greatest moments in life are the unexpected; those little pleasant instances where something you never saw coming happens, and, for better or worse, affect you in ways you never planned. Life's most sweet moments are those that happen by chance, or on a whim, coming from seemingly nowhere. Jesse, a young American, is taking the train through Europe on a vacation. Celine, a French student, is taking the train back to her college in Paris. Causal glances from both turn into small talk, which turns into lunch on the train's supper cart. Then, amid the conversation and small talk, Jesse gets an idea: why not get off the train, together, on the next stop, and spend the last 24 hours of his trip in Europe taking in the sights, and getting to know each other. Celine, with the help of Jesse's charm, agrees, and what follows is 90 minutes of two people in the act of falling in love. The best part of Before Sunrise is that this is all done with conversation; two people not just talking, but hearing one another on many levels, both casual and philosophical. We are watching two people fall in love because of their respect, and attraction, to one another's opinion's and thoughts and beliefs. Linklater's "less is more" approach to filmmaking has always made him one of the more respectable "current day" rising directors; not because of his camera angles or editing, but because of his dialogue. This isn't Kevin Smith dialogue -- wherein the people all talk like their dialogue was written by the same person. Linklater creates dialogue and scenes, that don't feel scripted. Instead, we are voyeurs, peeking and following these two people and listening in on their innermost feelings and conversations. These are two young adults, soon to be reaching the point in their lives where they have to take things seriously; settle down, find a job, raise a family, do the parents proud, find their places in life -- and the dialogue that comes from them reflects that. We listen to two people talk about their dreams and aspirations, the things and circumstances that have brought them to where they currently are in their lives, and where they want to be in the future. Scenes in this film have long, lingering takes. They are filmed as such so that we don't interrupt the conversations between Jesse and Celine. If Linkater had filmed the scenes with fast cuts, or too many edits, the viewer would loose balance of the conversation; their direction would turn away and the emphasis of the script, and acting, wouldn't be as appreciated. Ethan Hawke, whom I have had problems with as an actor in the past truly shines in what could be considered his finest role ever; before or since. His line delivery, his subtle body language, and his on-screen chemistry with Delpy are top notch. Delpy, likewise, really does the role justice; being a strong, opinionated woman with beliefs so strong that she becomes outraged and angered when someone makes fun of her opinions. Watching these two communicate back and forth really does make the viewer feel like they are simply watching two people pass by having heated debates and revealing conversation. I can't really call this "acting" by these two individuals; they simply become Jesse and Celine, and you forget that you are watching something that was entirely scripted and rehearsed. The magic of Before Sunrise is a perfect script; full of though provoking dialogue, and the subtlety of the actors engaged in conversations that truly fuel them. Not once while I was watching this film did I actually think I was watching a movie. Linklater, and his long takes, crafts this movie like some kind of documentary. He is creating his version of what he imagines it is like when two people meet, by chance, find that spark in one another; finding the physical and mental attraction, and he has a camera follow these two people over the course of 24 hours, and we watch how they ultimately fall in love (a decade later, director Sofia Coppola would make a film where you can clearly see Before Sunrises influence -- "Lost in Translation"). Before Sunrise is a very niche film. Not everyone will be able to watch this film, which is an unapologetically dialogue-driven movie, with long, lingering takes. The action here is watching two peoples hearts open to one another and watching them bond (which is very hard to do in Cinema; either it feels too forced, or the characters simply have no chemistry). This film successfully, in a rare instance in Cinema, creates two strong, powerful, opinionated characters who work well together -- who can state their opinions in a constructive manner, who respect each other to realize that opinions vary, and we should embrace each other as equals because of it. The script (conversation) in Before Sunrise is some of the best person-to-person conversation ever written down on a page. As the film closes, Linklater is smart enough to leave the end of the film up in the air. Jesse and Celine agree to meet each other again in six months time; with no phone calls in between or no communication. If they are meant to be together, they reason, then meeting each other in six months at a specific designated spot will prove it to them. Their giddiness and ability to become so childish with their plan relishes in their affection for one another; they become a storybook romance; taking pleasure in thinking of a love that knows no boundaries, or time lapses. As the train pulls out of the station, the Director gives us a brief montage of sets and areas that the characters, just 12 hours earlier, were occupying. These very same streets, and corners, and chairs, where these two people shared their thoughts, and beliefs, and began to fall in love, are now empty, and lonely and barren without them. The locations become visible time capsules; places that have been touched by these two young lovers and now are lonely without them. We watch them and feel sad that our time watching Jesse and Celine has already ended, and that they are now no longer together. We see these empty locations, think back, and smile, because we watched two people fall in love in these places. The sadness and the gladness mix into one thought: that love grew here. Richard Linklater has created one of the greatest love stories in the history of Cinema. He has done it by creating two characters that are fully believable as people -- not just characters. He has done it smartly, lovingly, and, most importantly, he has not sacrificed for one minute the true feelings of what people experience when falling in love; the shyness, the giddiness, being uncomfortable, and, over time, becoming more familiar with someone to the point that you can simply be yourself. As a fan of film, you owe it to yourself to watch this true treat and valentine to cinema. This is a movie that makes watching movies all worth it. There is nothing greater than watching two people fall in love. Before Sunrise is a treat for anyone who has ever been in love, and wants to relive those feelings of when two people first met.